Vacuum Tray Dryer is suitable for drying of thermal sensitive materials easily resolved, polymerized or deteriorated under higher temperature. Sterilization can be conducted prior to the drying process, during which no matter is allowed to enter the product. 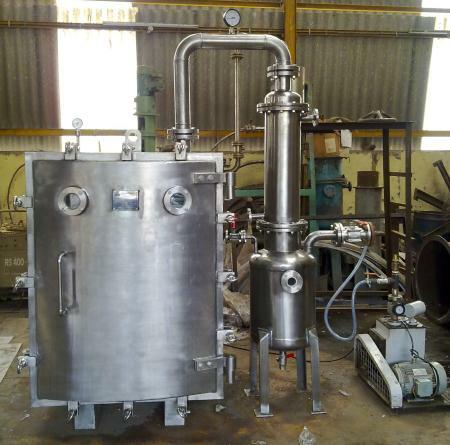 Static vacuum dryer eliminates the configuration damage of the drying materials, there fore widely used in pharmaceutical, chemicals and foodstuff etc,. Main Body/Vacuum chamber SS316 with heavy duty SS316 flange and Stiffeners. Door SS 316 (hemisphere shape) with heavy duty SS316 flange. Shelves Hollow Type pads SS316 with flow Baffles. Condenser (Shell&tube) and Receiver in SS 304 with Isolation valve and Flow Glass in between to monitor condensation. Trays (with out back folding) in SS316 rounded corners and edges. Explosion Vent/Rupture Disc on vacuum chamber. Digital Temperature Controller (FLP) with solenoid controlled Pneumatic operated valve at Hot Water inlet. Digital Temp., Indicator (FLP) at H.W. inlet & outlet. Dial type Vacuum gauge and Digital Temp., Indicator (FLP) in Vapor line. View Glass/Light glass provided on vacuum chamber Door, Body and Receiver. Drain valve for Vacuum chamber and Receiver. FINISH : Internal 320 Grit Mirror Polish and Outer 180 Grit Mat Finish. Heating Shelfs unit movble system fitted on SS316 Trolley and SS304 external Trolley. Limpet coil on Vacuum chamber. Hot water system (Steam heated) with tank (Insulated), SS304 Steam Radiator/Electrical heaters, Circulation pump with FLP Motor and controls.